Kotaku's twice weekly roundup of the best discounts, combinations, offers and incentives in video gaming is brought to you by Dealzon. 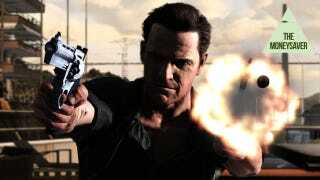 • Max Payne 3: Complete Pack is $14 (list $70). Deal ends today at noon EST. • Max Payne 3 standard is $10.88 (next best $40). Ends today 12PM Eastern! GamersGate is offering Civilization games and DLCs for up to 75% off this weekend. • PS3 DualShock 3 Wireless Controller is $39.98, free shipping from Walmart. Next best is $45. Less crazy than those prototype PlayStation 4 controllers floating around. • Discounts for Presidents Day weekend and a stackable coupon make the Alienware M17x r4 laptop $1349 (ties all-time low from Black Friday) with Core i7-3630QM, 6GB RAM, and 2GB NVIDIA GeForce GTX 660M. And a 1080p M17x with Radeon HD 7970M 2GB video card and 8GB RAM is $1,724. That's a new low by $100 (was $1824 on Wednesday) and $125 cheaper than Black Friday. • Alienware M18x with 1080p display, Ivy Bridge Core i7-3630QM, 2GB GeForce GTX 660M dropped to $1,749 after coupon. That's a new low by $50. • Lenovo has $480 and $500 coupons for IdeaPad Y400 laptops that make $749 deals for either 750GB 7200RPM or 1TB 5400RPM drives along with Ivy Bridge Core i7-3630QM, 8GB RAM, GeForce GT 650M 2GB, Windows 8. Also includes swappable optical bay. • HP ENVY h8-1520t desktop with Ivy Bridge Quad Core i7-3770, 8GB RAM, Radeon HD 7570, and Windows 8 is now $684.99 with $9.99 shipping from HP. New low by $15. List price is $800. Kotaku thanks our coupon partners for providing these and other great deals. As always, smart gamers can find values any day of the week, so if you've run across a deal, share it with us in the comments. For more savings, follow Dealzon on Twitter.